26 The poor will eat and be satisfied; they who seek the LORD will praise him- may your hearts live forever! 29 All the rich of the earth will feast and worship; all who go down to the dust will kneel before him- those who cannot keep themselves alive. 31 They will proclaim his righteousness to a people yet unborn- for he has done it. 16 The soldiers led Jesus away into the palace (that is, the Praetorium) and called together the whole company of soldiers. 17 They put a purple robe on him, then twisted together a crown of thorns and set it on him. 19 Again and again they struck him on the head with a staff and spit on him. Falling on their knees, they paid homage to him. 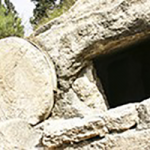 22 They brought Jesus to the place called Golgotha (which means “the place of the skull”). 31 In the same way the chief priests and the teachers of the law mocked him among themselves. “He saved others,” they said, “but he can’t save himself! 34 And at three in the afternoon Jesus cried out in a loud voice, “Eloi, Eloi, lema sabachthani?” (which means “My God, my God, why have you forsaken me?”).